Secret Archives Lost Symbol and Da Vinci's Prophecy! On each page you'll find that your cursor has a secret message to decipher. Decipher them all, then e-mail me with your answer and win a free e-book version of my novel. Now!! Every second you wait your life is in peril my friend! Need answers to the DaVinci Code Challenge or Contest? It's cheap: $2.50. Click on Lulu.com button to get answers and preview of The Solomon Key! "when one has eliminated all that is impossible, whatever remains, however improbable, must be the truth!" Nothing is true; Nothing is forbidden. And The Hermetic Order of the Golden Dawn! Action, thrills, femme fatales. I dare you! 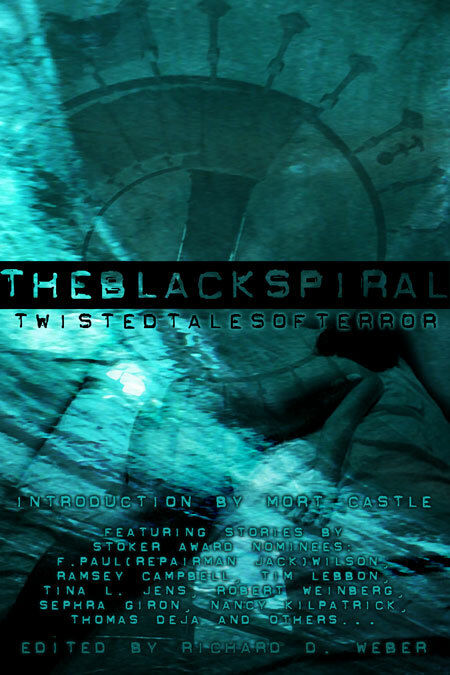 THE BLACK SPIRAL:TWISTED TALES OF TERROR! IBSN 1-897013-22-1 Click image to buy! 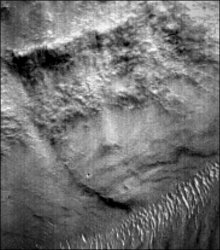 Or does Dan Brown think Da Vinci hid a code on Mars? days 'til The End of The World. 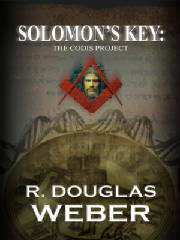 THE STORY IS FEATURED IN MY NEW THRILLER SOLOMON'S KEY! While most events and persons in this novel are made from the whole cloth of my imagination, others are not. Le Cahier de la Rose Noire actually exists in the form of Le Cahier Rose written by the Abbé Boullan and is indeed, locked away in the Vatican's Secret Archives. All requests to view it have been denied. 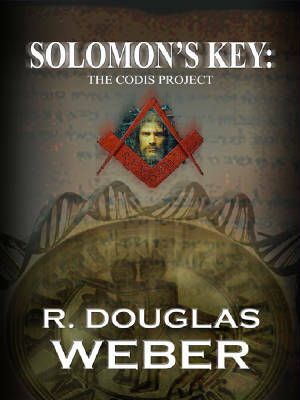 References to Occult Secret Societies and their practitioners are historically accurate. However, Protocol-17--while being the author's invention, is based upon a historical document: The Protocols of the Learned Elders of Zion. While attributed to the Russian Czar's Secret Police, and later adopted by Hitler's Nazi Germany as anti-Semitic propaganda, some believe it to be in reality--the hidden plan of the Illuminati. A plan for implementation of the NOVUS ORDO SECLORUM. Let's hope not! Also designed by a Freemason! 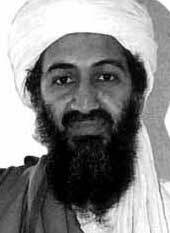 Some say he bears a striking resemblance to George Washington! What was the Bavarian Illuminati? 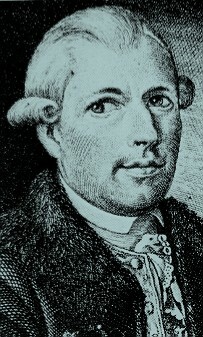 Adam Weishaupt founded the Illuminati of Bavaria on May 1, 1776 on the principles of his early training as a Jesuit. Originally called the Order of the Perfectibilists, "its professed object was, by the mutual assistance of its members, to attain the highest possible degree of morality and virtue, and to lay the foundation for the reformation of the world by the association of good men to oppose the progress of moral evil." They sought enlightenment through the application of --scientific reason--rather than the then current accepted model of reliance on the teaching and proclamations of the Church or--pure faith. However, they did sanction the overthrow of the Monarchies of Europe. Once an Illuminati nightrider's secret dispatch was discovered--the Order was forced to disband. Some say they never did. Some say they burrowed further underground, became absorbed and secreted within the folds of freemasonry, between layers of disinformation weaved by powerful, ranking members of government, banking, and the Catholic and Protestant Churches. An order was given on June 22, 1784, for its suppression) by the Elector of Bavaria and was repeated in March and August, 1785. The Order began to decline, so that by the end of the eighteenth century it had ceased to exist.... it exercised while in prosperity no favorable influence on the Masonic Institution, nor any unfavorable effect on it by its dissolution. "(or so say the Masons!) Coil describes the Order as a "short lived, meteoric and controversial society" while Kenning refers to it as a "mischievous association". But let's hear what the founder of the order had to say. Sometines the truth is much stranger than the fiction! In his own defense, Weishaupt said: "Whoever does not close his ear to the lamentations of the miserable, nor his heart to gentle pity; whoever is the friend and brother of the unfortunate ... ; whoever does not mock and despise the weak; whose soul is susceptible of conceiving great designs, desirous of rising superior to all base motives, and of distinguishing itself by deeds of benevolence; whoever shuns idleness; whoever considers no knowledge as unessential which he may have the opportunity of acquiring, regarding the knowledge of mankind as his chief study; whoever, when truth and virtue are in question, despising the approbation of the multitude, is sufficiently courageous to follow the dictates of his own heart, - such a one is a proper candidate." Therefore, documented evidence would suggest that the Bavarian Illuminati was nothing more than a curious historical footnote. And how about those Satanic Symbols! Soon to be featured in the Solomen Key? ... 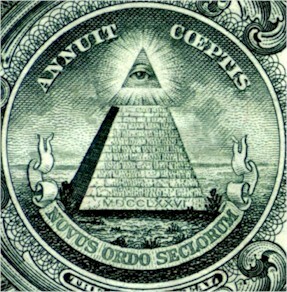 The first "official" use and definition of the all-seeing eye as a Masonic symbol seems to have come in 1797 with The Freemasons Monitor of Thomas Smith Webb--14 years after Congress adopted the design for the Seal: "...and although our thoughts, words and actions, may be hidden from the eyes of man yet that All-Seeing Eye, whom the Sun Moon and Stars obey, and under whose watchful care even comets perform their stupendous revolutions, pervades the inmost recesses of the human heart, and will reward us according to our merits." There is no question that the intersections of Massachusetts Ave., Road Island Ave., Connecticut Ave., Vermont Ave. and K Street NW form a five pointed star. It is also true that many of the city's architects in the nineteenth and early twentieth century were Freemasons. From these two facts, and a plethora of imaginative conjecture, many writers have concluded that the city was intentionally planned to promote an occult agenda. Pierre Charles LÈnfant, architect of city plan, was a mason. 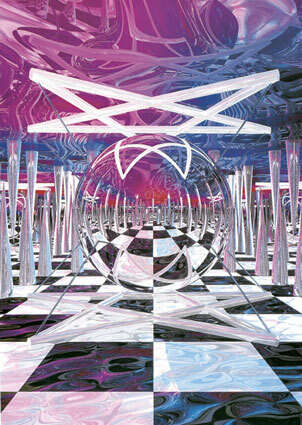 Artist's rendering of Masonic Symbols. Notice the Inverted Pentagram on Top! It holds the secret of his Magick! Take away the hair and moustache and we have !! 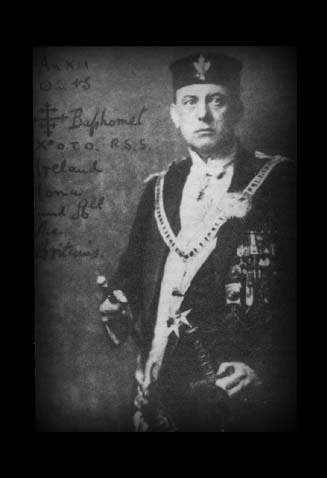 Aleister Crowley in Masonic Regalia! Uncle Al's magical name was "Bhaphomet" (Inverted Pentegram) although he prferred "The Beast!" Symbol of the O.T.O.--Yes, they're for real! Founded in Germany with chapters throughout the world. Based on Masonic Rites of Initiation. Possible Authors of the Necronomicon ... See below! 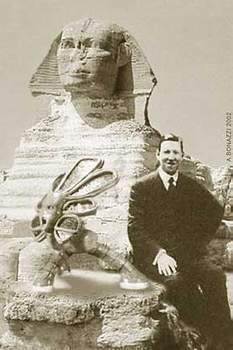 Howard Philips Lovecraft was a novelist and short fiction writer who specialized in the macabre, or the "Cosmic Terror" as he called it. Every Sci-Fi and horror writer from Stephen King to Peter Straub, from Ray Bradbury to Dean Koontz has studied his work. Magic realism and the technique of weaving historical and scientific fact into the storyline, creating a sense of reality and authenticity was his trademark. "Regarding the Necronomicon -- I must confess that this monstrous & abhorred volume is merely a figment of my own imagination! Inventing horrible books is quite a pastime among devotees of the weird, & ..... many of the regular W.T. contributors have such things to their credit -- or discredit. It rather amuses the different writers to use one another's synthetic demons & imaginary books in their stories -- so that Clark Ashton Smith often speaks of my Necronomicon while I refer to his Book of Eibon .. & so on. This pooling of resources tends to build up quite a pseudo-convincing background of dark mythology, legendry, & bibliography -- though of course none of us has the least wish actually to mislead readers"
A book that brings madness and damnation to all who read it was the idea. However, it was first incorporated by Chambers in his the King in Yellow novel. H.P. Lovecraft ... well kind of borrowed the idea--as I have--along with allusions to the Cthylu Mythos: an ancient race of gods--aptly named the "Old Ones" or "Ancient Ones" who once ruled the earth and still "lurk at the door" to this dimension ... so to speak. Even though this is pure fiction, created by these wonderful writer's immaginations, there are those (a cult following of so-called ceremonial magicians) who actually use the "HOAX" NECRONOMICON as if it were an actual Book of Shadows! Yes, there are those that swear it's the real thing and that the magick works! 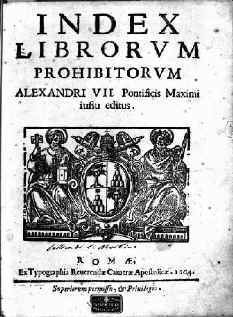 Credible scholars have shown that most of the top-ten black magick books (grimoires) are attributed to real-life historical figures--Soloman, Pope Leo and Honorious--but written much later in time. And not by the author listed on their cover. 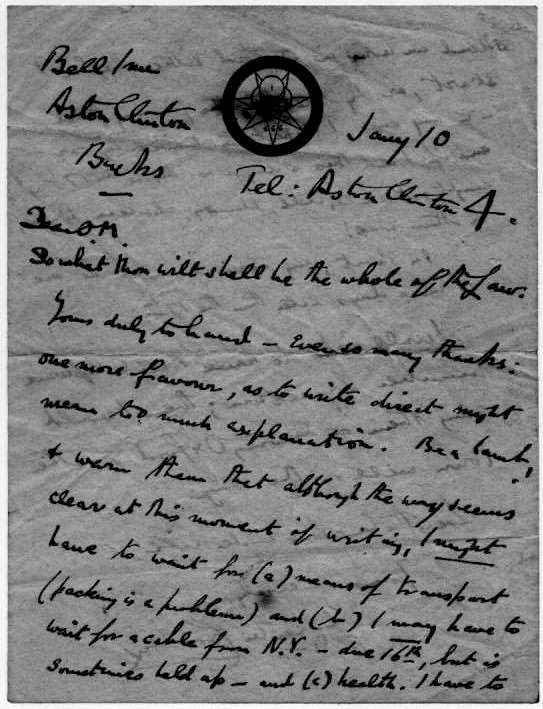 So if fact and fiction become blurred over time, and some choose to believe a fictional Mad Arab, Abdul Alhazred of Ancient Syria, wrote the magick spells instead of Mr. Turner ... what's the harm. My take is that it's a tribute to the eternal power of the writer's pen and the reader's quest for adventure and mystery. Go to next archives page for HOAXES that may not be-- quite so harmless! BELOW ARE THE TRUE AUTHORS OF THE NECRONOMICON. HONEST INDJUN' ... I SWEAR!! BESIDES, THEY TOLD ME SO! Secret Masters of our World! Whitley Strieber is their leader! THE MAD ARAB: ABDUL AL-HAZRED! HAS USED THE BOOK TO BECOME INVISIBLE! Just how paranoid are you?